Even tough Big is a perfect movie, it would be nearly impossible to make now. Why you may ask, because of the internet. Now Josh could simply Google search where the fair is going and bing-bang-boom, he’s a kid again. That is one of the many hurdles that are navigated and we have special guest Doug Bashore to help out along the way. So how’d we do? Let us know and let us know what movie you’d like to hear given the PSRR treatment. AVAILABLE ON iTUNES, GOOGLE PLAY OR WHEREVER YOU ENJOY YOU PODCASTS! Posted on February 8, 2019 by Reservoir Geeks and tagged Remake. When Left 4 Dead came out, we were instantly in love! The game is comprised of four separate stories which are split into multiple levels divided by safe houses. The makers of the game, Valve, even went so far as to give each story it’s own movie style poster. It’s hard to believe that the instant classic of Left 4 Dead came out 10 years ago (11/17/08) but even more unbelievable is that it had yet to be given the silver screen treatment it deserves. Well we are looking to set that right with out pitch for a Left 4 Dead movie! PLEASE NOTE: This episode was recorded very late into the evening. Andy is well aware that he referred to Louis as Francis multiple times near the end. Thanks! Posted on November 17, 2018 by Reservoir Geeks. Chris and Andy are joined by Reservoir Geeks contributor Doug Bashore to pound out the details on a respectable sequel to the 80’s classic The Goonies. Doug is one of The Goonies biggest fans and not only are we lucky to have him guest on this episode but The Goonies are lucky to have him on board to pitch this follow-up. NO BOAT! Posted on November 10, 2018 by Reservoir Geeks. Chris and Andy went to see Jurassic World: Fallen/Forgotten Kingdom dashed out to the parking lot to get their reaction on digital tape, before they even talked to each other about it. Just like with most audiences, one of them loved it and the other one did not. If you've seen Jurassic World: Fallen Kingdom or don't mind spoilers, enjoy this episode! Posted on June 22, 2018 by Reservoir Geeks. Doug and Andy went to see Avengers: Infinity War and, after a beer to calm their excitement, fired up the mic and recorded this spoiler packed Parking Lot Review. If you've seen Avengers: Infinity War or don't mind spoilers, enjoy this episode! Posted on April 28, 2018 by Reservoir Geeks. Doug and Andy enjoyed a Saturday matanee of Super Troopers and ran outside to record their immediate thoughts about the movie in the parking lot! If you've seen Super Troopers 2 or don't mind spoilers, enjoy this episode! Posted on April 21, 2018 by Reservoir Geeks. Almost two years ago, April 26th of 2016 to be exact, while recording an episode of Reservoir Geeks the inception of PSRR was born. It came about from a discussion on why a quality film version of Ninja Turtles is so hard to make, Andy claims Super Mario Bros is impossible to film and the rest is history. Since the discussion was tucked away in an episode of another podcast, we thought it was time to release it on it's own. We hope you enjoy it. If you have a movie you think deserves the old PSRR treatment, let us know! Posted on April 2, 2018 by Reservoir Geeks. Chris, Doug and Andy went to see Ready Player One. Afterward they recorded this spoiler full mini-episode of Prequel. Sequel. Reboot. Remake. about their likes and dislike in the film. Everything from style, references and how the movie compares to the book. If you've seen Ready Player One or don't mind spoilers, enjoy this episode we recorded in the parking lot of the theater immediately after enjoying the flick! Posted on March 31, 2018 by Reservoir Geeks and tagged Parking Lot Review. 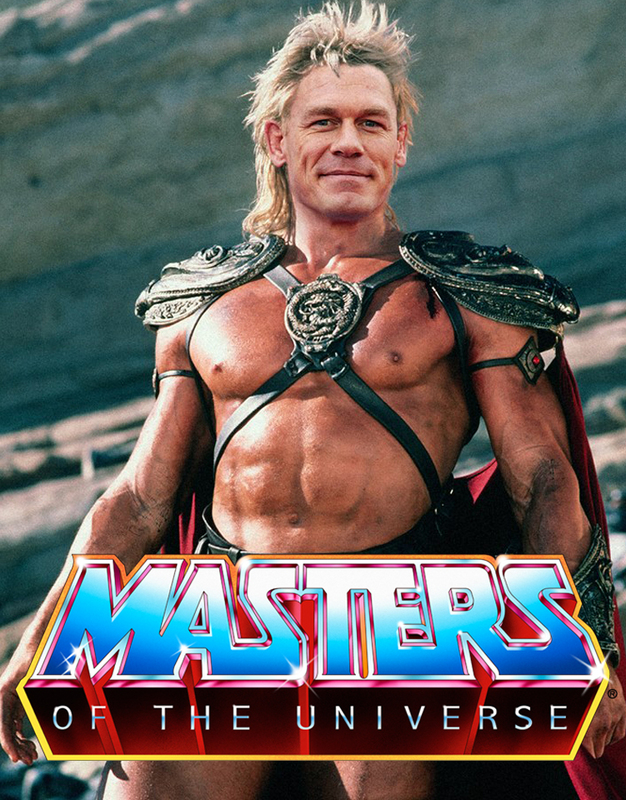 Since it came out we have been fans of the original Masters of the Universe and 1987 Cannon Films tried THEIR best. Since then we've been waiting for a true to the original version of MOTU on the big screen. After seeing how David Goyer is planning on ruining He-Man and the gang, we decided to take action! So lift aloft your earbuds and throw them in your ears. HERE IS THE PODCAST! NOTE: The idea of pitching hypothetical prequels, sequel, reboots and/or remakes is so original and brilliant that we have a copycat out there. From logo to intro to concept. It's the exact same thing, just not as fun to listen to. If you could do us a favor and rate and review PRSS on iTunes or wherever you listen to podcasts, we would greatly appreciate it! Posted on March 21, 2018 by Reservoir Geeks and tagged reboot. Sticking with the theme of pitching better versions of the rehashed garbage Hollywood is throwing at the wall we present our remake of Death Wish. With some controversial casting the boys lay out reasons why what initially seems terrible will lead to cinematic gold. Posted on February 26, 2018 by Reservoir Geeks and tagged Remake. With a film version of the hit videogame Rampage on the horizon we look at what could have been if producers listened to this podcast. Instead it seems they watched San Andreas and decided to do that exact same thing but now with animals instead of fault lines. So if you liked San Andreas and thought you needed more of that... you're a DAMN FOOL. Be smart. Enjoy this episode of PSRR! Also, sorry it's been so long since our last episode. Our very own Chris and his wife welcomed a beautiful baby into their life and we had to take a bit of a break to Tetris everything into place here at Reservoir Geeks HQ. We have some awesome stuff coming in 2018 and we can't wait for you to see it. Don't worry Prequel. Sequel. Reboot. Remake. is still on the schedule and will be coming out with more episodes in 2018!!! Posted on November 16, 2017 by Reservoir Geeks and tagged Reboot Remake. What better way to celebrate Christmas than revisiting everybody's favorite neglected child, Kevin McCallister. To celebrate the holiday season Chris and Andy are joined by two guests to work out the story of a Home Alone sequel which is more than anyone did with Home Alone 3. Bust out those chestnuts, light up that fire and hit play on this adult sequel to a family classic! Posted on December 16, 2016 by Reservoir Geeks and tagged sequel. A game series we have loved since the early 2000's is Hitman and when in 2006 there was news of a Hitman movie, we were excited... Then we saw it. Ugh. Hope was once more raised in 2014 when news of a reboot was swirling and then we saw the trailer for Hitman: Agent 47. Though it wasn't as bad as the 2007 disaster, it still missed the mark (pun intended). With no other option, we are happily pleased to give the PSRR treatment to one of our favorite games, Hitman. Posted on November 21, 2016 by Reservoir Geeks and tagged reboot. In honor of Halloween we gave a sequel to a series that well deserves one, 28 Days/Week Later. We loved 28 Days Later so much we saw it three times in as many weeks at the theater. We could not get enough of it. When 28 Weeks Later came out we were once again thrilled so then we waited... and waited for 28 Months Later to come out. We are all still waiting and we know our prayers will one day be answered but until then we decided to sit down and gave it the ol' PSRR treatment. More horrifying than all the rage infected people is our math. Enjoy! We hope y'all have/had a fabulous, safe and Happy Halloween! Posted on October 31, 2016 by Reservoir Geeks and tagged sequel. On episode ten of the Reservoir Geeks podcast we discussed Gerard Butler's movie London Has Fallen and our new found love for Butler himself. So in an unprecedented move we decided to pitch an epic super movie wherein Gerard Butler fights everyone from tons of movies. We hope you enjoy listening to as much as we loved recording this episode! Also: "Ding-Dong"... That'll make much more sense after you hear the episode. Posted on October 15, 2016 by Reservoir Geeks. Rouge robots and a makeup free rocker tried to take down Magnum PI in 1984's Runaway. It's time that classic was given the PSRR treatment! At two in the morning, drunk and sleepy, Chris and Andy hammered out the details of a remake. It was the only way to give it the respect it deserved. Replacing Tom Selleck in both actor and voice... In fact, everyone gets dubbed over when Andy discovers he has an untapped impression in his files. Posted on September 4, 2016 by Reservoir Geeks and tagged sequel. The new Ghostbusters came out and it was wonderful so in honor of it and the original we decided to take a shot at a sequel to Ghostbusters 2. Spoilers: we nailed it! Posted on July 21, 2016 by Reservoir Geeks and tagged sequel. Technically a reboot from a television series to a feature film, Chris and Andy flesh out an ALF film. Based on the 80's puppet/little person in a suit situation comedy about a family who happens to have a cat hungry alien life form living in their house. Posted on June 21, 2016 by Reservoir Geeks and tagged reboot. In honor of the release of Teenage Mutant Ninja Turtles: Out of the Shadows, or whatever it's called, Chris and Andy are joined by their good friend and Ninja Turtles aficionado Matt Reuber to pitch a sequel to the 1990 TMNT film. They threw out everything since and start from Shredder in the garbage truck. You're welcome in advance. Posted on June 7, 2016 by Reservoir Geeks and tagged sequel. We love Cloak and Dagger and in light of all the 80's remakes we thought it was time for a true classic to get the treatment. Technology and times have changed since '84 and we work through all the updates to make sure our version is flawless. Mission Accomplished! Posted on May 22, 2016 by Reservoir Geeks and tagged remake.